The UE Bookstore is offering 15% OFF the original price of all clothing and gift purchases Monday-Wednesday, November 20-22, for the Thanksgiving holiday. Items already discount are exempt from additional discount. Stop in and see some of the holiday door busters we have on sale and get an early start to holiday shopping. Please keep in mind the UE Bookstore closes at NOON on November 22. You are invited to attend a personal wellness seminar hosted by UE third year PT students. The seminar will take place on November 27 from noon-1:00 p.m. in Eykamp Hall, Room 253, Ridgway University Center. Come learn ideas for your personal fitness plan! A reception for Mark Logel will be held on November 28 from 2:00-4:00 p.m. in Dunigan Hall Lounge in the Schroeder Family School of Business Building. Mark is leaving the University after 28 years of loyal service. Please make time to stop by and say goodbye to Mark. The University of Evansville Department of Music invites the public to ring in the holiday season at the annual Holiday Pops Concert. For nearly four decades, students, faculty, and soloists have shared their talent and celebrated the spirit of the season with music. This year - for the first time - the Holiday Pops Concert will be presented both in Evansville and in Henderson, Kentucky. Both presentations are free and open to the public. The Evansville concert will be at the Victory Theatre downtown, at 7:30 p.m. on Tuesday, December 6. This presentation is made possible through the generosity of Mesker Music Trust by Fifth Third Bank, trustee. The Henderson concert will be at the Preston Arts Center at 7:30 p.m. on Wednesday, December 7. This presentation is part of a budding partnership with the center. UE’s music programs also have the support of the Friends of UE Music. UE’s choirs, Wind Ensemble, Symphony Orchestra, and University Band are among the ensembles audiences can expect to enjoy at this year’s event, along with an added touch of community spirit. The featured guest for the concert is Evansville’s own Gina Moore. A graduate of Central High School, Moore has appeared frequently as a soloist around the Tristate. She began singing with her church choir in the late 1970s. Since then she has made numerous appearances, both as a soloist and with her sister Joan as a member of The Browne Sisters, with ensembles ranging from choirs to the Evansville Philharmonic Orchestra. Moore will sing a number of holiday favorites, including Sweet Little Jesus Boy, Have Yourself a Merry Little Christmas, and The Christmas Song. Each of UE’s student music ensembles will also perform during the evening. Orchestra selections include variations on Joy to the World, the University Choir will perform Amazing Grace, featuring Moore as soloist, and the Wind Ensemble will share their rendition of the Leroy Anderson’s classic Sleigh Ride. The concert concludes with all of the department’s ensembles joining on-stage for an audience sing-a-long, and likely a visit from a right jolly old elf! The Department is pleased to partner with the Tri-State Food Bank and Christian Charities Food Bank for this year’s event. Tickets are free, but attendees are encouraged to bring a donation of canned food, which the food banks will share with those in need. For more information about the UE Department of Music, please visit music.evansville.edu. Interested in joining a sorority? Come join the women of Phi Mu today from 6:00-7:00 p.m. in the Phi Mu Suite for a night full of sisterhood and philanthropy. We will be making holiday cards for the Children at Riley Hospital and spreading some holiday cheer. If you have any questions or cannot make it to the event, contact Katelyn Hedinger at kh327@evansville.edu. The Honors Program invites you to attend the Honors Program Project Presentations on Monday, November 27, 4:00 p.m. Room 101 in Koch Center for Engineering and Science. Honors Program student Anna Kalt will be presenting her Honors project “The Economics Behind Politics: A Study of the United States and United Kingdom” at this event. The Honors project represents the culmination of the Honors Program experience and provides an opportunity for students to explore an area about which they are passionate. The Honors project may consist of a research project, thesis, or creative work. Students may use the Honors project to launch areas of interest for graduate study or to expand résumés for employment. Phi Mu is hosting a giveback night with MOD Pizza on Tuesday, November 28 from 4:00-9:00 p.m. which benefits Children's Miracle Network Hospitals. Please show this flyer at the register to have 20% of your meal purchase go CMNH. The UE Community is invited to the UE Connect Lunch and Learn on Wednesday, November 29. Thinking through all the aspects of being "market ready" for that first or next step in your career. Understanding your brand and the culture of those prospective employers. Kara E. Hensley, SPHR, SHRM-SCP is vice president, talent + brand of Cripe. She joined the Cripe administrative staff in November = 2007. Kara is a member of the executive leadership team and in 2013 assumed additional leadership responsibility for the marketing department. Prior to Cripe, Kara worked in various human resource and marketing leadership roles with Allison Transmission/General Motors, Thomson Consumer Electronics, and Keramida Environmental. Throughout her over 20 year career, spanning the gamut from labor relations and negotiations to organizational development and coaching, Kara has provided strategic leadership and outcomes to the organizations she serves. When: Wednesday, November 29, noon - 1:00 p.m. 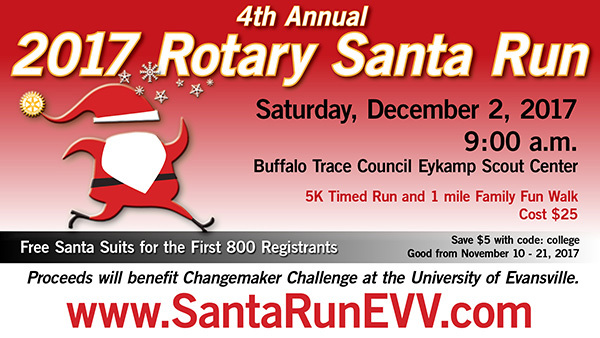 The Rotary Santa Run will be held on Saturday, December 2nd at 9am at the Buffalo Trace Center. It is a perfect way to begin your run into the holiday season. This 5K Run/Walk and/or and 1 Mile stroll is an event that is fun for the participants and spectators alike. Each participant receives a 5-piece Santa outfit, including a beard. They are asked to wear the Santa suit in the event. Prizes will be given for the most decorative. What a sight! Proceeds from the 2017 Santa Run will benefit the University of Evansville's Changemaker Challenge program for 2018. This program follows the mission statement of Rotary's by empowering the leaders of tomorrow to make a better community for all. Local students compete with innovative ideas to make our community a better destination. The UE Jazz Ensemble I will present its Essential Ellington Concert on Tuesday, November 28 at 7:30 p.m. in Wheeler Concert Hall. The concert is free and open to the public, however if you purchase a $25 ticket you will get preferred seating and be invited to a post-concert reception on stage. The reception will include an open bar and light hors d'oeuvres. Please RSVP by Monday, November 20, by calling 812-488-2754 or going online at www.uealumnionline.com/Ellington. All proceeds will benefit the department of music. The concert will feature student and faculty soloist, dancers, and a lecture by UE's musicologist Kristen Strandberg. Wheeler Concert Hall will also be converted into the famed Cotton Club. Come swing with us! Tuesday, November 21: 7:45 a.m.–10:00 p.m.
Are you interested in becoming a physician assistant? If you would you like to help start a club geared towards just that, then fill out an application become an officer for the club starting in January. Applications are due on December 1 to Haley Vos at hv25@evansville.edu. Those selected will be notified the following week. The Student Health Center will be closed on Wednesday, November 22 through Friday, November 24. The Student Health Center will reopen Monday, November 27 at 8:00 a.m. In the event you need medical care, please contact Campus Security at 812-488-2051 or dial 911. The Health Center staff would like to wish everyone a safe and happy Thanksgiving break. If you are graduating in December and have earned a military honorable discharge or a general discharge under honorable conditions, are on active duty, in active drilling status, or are an ROTC cadet, please notify Cherie Leonhardt in the Office of Veterans Affairs at CL29@evansville.edu or call 488-2141 ASAP. The Office of Veterans Affairs and UE VETS have a special graduation gift for you! University of Evansville has partnered with Kaplan to offer MCAT Test Prep sessions. The course will run in the spring starting in January for students looking to take the MCAT in April, May, June, or later. The classes will meet at the University of Evansville for three hours on Wednesday nights for 12 weeks. In December, the location of the room will be sent to those registered for the course. The deadline to register is December 1. Space is limited! Special pricing for UE students at $1,499. Please visit www.evansville.edu/adulteducation/kaplan-mcat-review-course-pay-ue.cfm to register and for more details. Volunteers are needed for the Rotary Santa Run that takes place on Saturday, December 2. It is a great way to get into the holiday spirit and interact with the Evansville community! Volunteers need to meet in the Vann Avenue ballfields parking lot across from where Walnut dead ends into Vann Avenue at 8:00 a.m. the day of the race. They will get their street assignments then. They will be barricade monitors at race course intersections: making sure the barricades are in place 30 minutes before the 9:00 a.m. start time and taking them down after the runners finish their portion of the course. Some of the beginning streets are also blocked for the end of the race, so some volunteers may be there until 10-10:30 a.m. for the walkers. They are free to go once the runners/walkers are past their intersection (some early; some later), but all are invited up to the Eykamp Boy Scout Center for refreshments, photos with Santa, and just a little post-race fun. We ask they please wear Santa hats or other Santa-like apparel if they can. Otherwise, please try to wear red. The Rotarians will also have some Santa accessories on hand if they do not have anything available. For more information and to sign up please contact Amy Walker at awalker@pefevansville.org or 812-422-1699. The $75 deposit for Alternative Spring Break, the trip to provide long-term disaster response work in Houston, is due by Tuesday, November 21. You can turn it in to Kelly at the Center for Student Engagement. If you have any questions, please contact Jackie Luedtke at jl295@evansville.edu. Submitted by Jackie Luedtke jl295@evansville.edu. Monday, November 20 and Tuesday, November 21 from 6:30 a.m.-10:00 p.m. The campus grounds workers will begin installation of outdoor Christmas decorations on November 13 in preparation for the campus lighting ceremony on December 1. All campus Christmas trees will be delivered the mornings of November 21 and 22. If you have questions, contact Bob Dale at ext. 2046 or bd22@evansville.edu. Graves Hall is collecting new gloves, mittens, socks, hats, and scarves for community children grades K-12 this Christmas season. The items can be placed on the Christmas tree in Graves Hall lobby through December 15. The Center for Family, School and Community Partnerships will distribute the items to EVSC K-12 schools. Please call Karen Doss at ext. 2360 if you have any questions. Thank you! 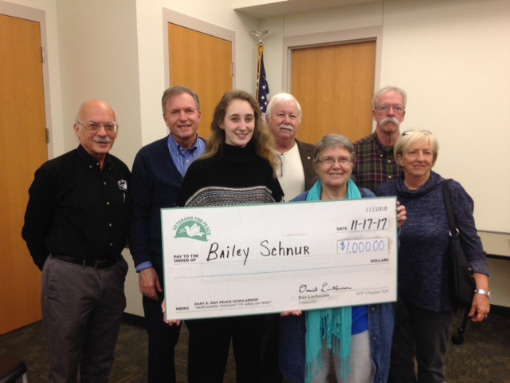 Senior Bailey Schnur, a secondary social studies education major, was the recipient of the Gary E. May Peace Scholarship. Applicants were invited to write about a variety of topics. Bailey chose to address "How do we assess the true cost of war?" There were 37 students from across the region who submitted essays. This was the second time Bailey has won the award. Congrats, Bailey!